Movie theater- style popcorn is loaded with butter and salt, which offsets the beneficial nutritional value of the whole grain popcorn kernels themselves. Most microwaved popcorn brands are made with “natural and artificial flavors”, “color added”, and TBHQ– which is an additive Center for Science in the Public Interest (CSPI) recommends avoiding since it’s related to BHA, a chemical that may be a carcinogen. 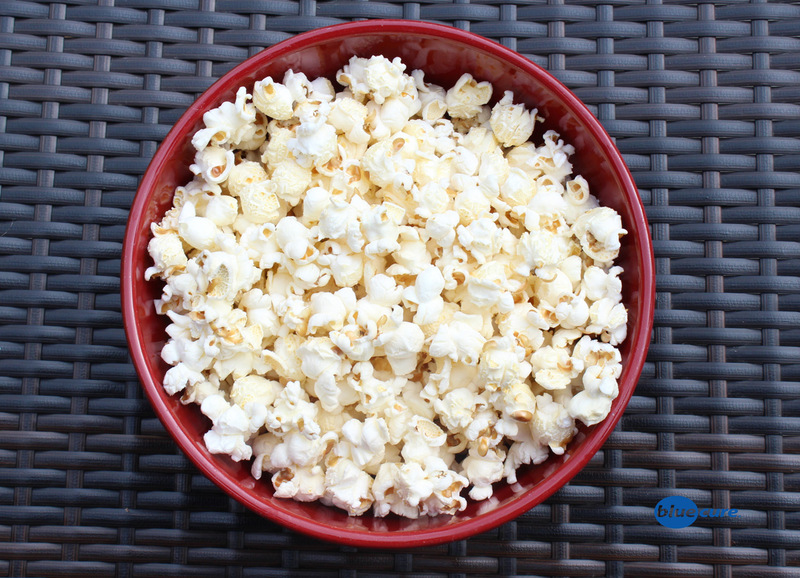 Air popped popcorn, on the other hand, is a satisfying, healthy alternative! In fact, 5-7 cups of air popped popcorn has ~ 5 grams of protein, 5 grams of fiber, and only about 120-150 calories (nutritional values varies by variety)! Popcorn is also a good source of magnesium and phosphorus. Another value of using air popped popcorn is that you can control how much oil and salt you add to the kernels; a little goes a long ways! Fill the popcorn machine using a measuring cup or measuring line on you popcorn machine (see unite instructions). Place a bowl under the popcorn machine and turn it on. Allow the kernels to pop, then turn off. 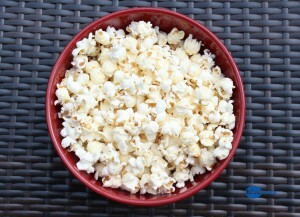 You can enjoy the popcorn without any oil or drizzle 1/2 tbsp of extra virgin olive oil over the top of the popcorn. Add spices if you’d like, or just lightly shake on some salt. Lightly shake the bowl to coat with the oil and spices of choice.